Self-test: How Engaged Is Your Organization? If you're seeking to create a culture of high engagement you're not alone. Great clinical quality depends on it. Price pressures demand it. Where engagement doesn't exist, all stakeholders suffer. Employees leave, physicians burn out, patients neglect their care plans, lose trust in their caregivers, and drift away altogether. These are costly problems. Craig Deao has created a unique and progressive four-pronged model to help organizations solve them. 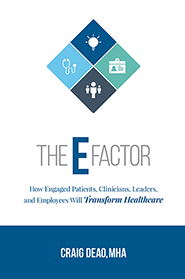 In The E-Factor, he shows how engagement cascades from the top: it starts with leaders, flows down to employees and physicians, and finally reaches (and activates) patients. He then lays out a step-by-step strategy for engaging all four groups simultaneously. Why engagement and satisfaction are not synonyms. Satisfaction is a one-way street, engagement a two-way street-it's what inspires you to put forth effort even when no one is watching. A high-engagement culture is no longer optional. It's mandatory-and urgent. This book is a needed roadmap to help you navigate the rapidly shifting dynamics and market forces that are reshaping our industry. Craig Deao, MHA is a senior leader and national speaker at Studer Group, a Huron Healthcare solution, where he co-led the organization's journey to become a recipient of the Malcolm Baldrige National Quality Award. 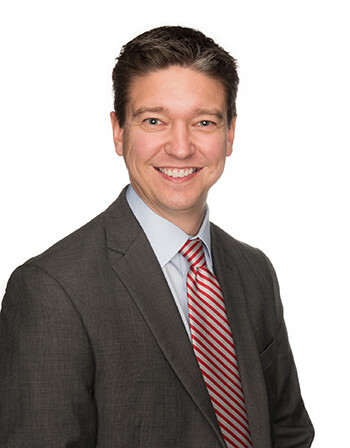 As a sought-after speaker on topics related to leadership, patient engagement, quality and patient safety, Craig also serves as faculty for the American College of Healthcare Executives. Only 30% of American employees are engaged in their job today. The percent of patients engaged in their care is even less. During this 7-minute video, Craig Deao, Studer Group Senior Leader and Speaker, provides insight into the current state of engagement. Patient engagement is not the same as patient satisfaction. A patient can be satisfied because they are discharged from the hospital but they may not be engaged in taking greater responsibility for their health. Watch as Craig Deao, Studer Group Senior Leader and Speaker, explains the evolution from satisfaction to experience to engagement.